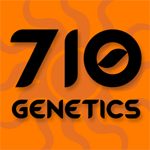 710 Genetics - Andromina. Free US delivery. Andromina is a high yielding and hard hitting strain. An Indica dominant variety that's aroma ranges from a peppery scent to the smell of blackberries. This marijuana strain is not intended for someone who enjoys the sweeter smoke. Andromina's taste is smoky and spicy and similar to hashish instead of herb. Andromina provides a very heavy indica high, with overpowering body effects.